Perhaps because taxation was such a fundamental issue to our founders, it was only the number of taxable inhabitants that formed the basis for district sizes (not population). This remained true in the 1790, 1838, and 1857 revisions. Our Constitution underwent a major rewrite in 1874 and was adjusted to use population as the foundation for district sizes rather than just the taxable inhabitants. Our founders firmly believed that unified political subdivisions offered the citizens of Pennsylvania the strongest representation possible. This belief was protected and preserved in all four of these State Constitutional revisions. As Pennsylvania’s constitution neared its bicentennial, winds of change began to blow in national circles that might alter our nearly 200 year tradition for representation. In the 1960s, the US Supreme Court began rendering decisions that indicated systems like the one used in Pennsylvania were starting to conflict with principles of equality. These rulings did not forbid political subdivisions from remaining whole or disqualify unified political subdivisions from forming the basis of districts. In short, they said political subdivision could not be left whole in State districts if it violated principles of equality. For population equality, a 10% overall deviation between districts was established by the court as a “minor deviation” from equality. They believed that this deviation would strike a balance between allowing states (like Pennsylvania) to, in most cases, continue to honor their long-standing tradition of keeping political subdivisions whole without sacrificing equality. Districts were to be formed of “compact and contiguous territory”. “As nearly equal in population as may be” – was modified to “as nearly equal in population as practicable” and applied to both Senate and House districts. “No ward, borough or township shall be divided in the formation of a district” was applied to both Senate and House districts and modified to include counties and cities (previously protected by the now eliminated ratio system) and prefaced by “unless absolutely necessary”. 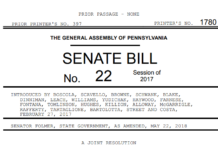 These changes allowed Pennsylvania to comply with the new standards but still protect unified political subdivisions in the strongest terms possible – “no” and “absolutely”. It acknowledged the inevitable nature of dividing some political subdivisions in complying with equality requirements, while limiting the circumstances that allowed for a division. Approved in 1968, this new system for apportioning state representatives and senators has been used in the five most recent redistricting cycles (1971, 1981, 1991, 2001, and 2011). Does Representation Matter to Me? Should Political Subdivisions Stay Whole? Sign-up for email updates to receive the latest posts. Previous articleDoes Representation Matter to Me? Next articleShould Political Subdivisions Stay Whole?